The Oregon Advancing Conservation Excellence (ACE) Initiative is a partnership of the Land Trust Alliance and the Yarg Foundation. The first stage of ACE (2012-2017) focused on a sustained investment of targeted services to enhance the effectiveness and capacity of the Oregon land trust community while helping the Coalition of Oregon Land Trusts (COLT) launch. As part of these services, the ACE grant program has thoughtfully invested nearly $4.2 million in 17 land trusts and COLT, matched by over $4 million, to support a range of priority needs and opportunities as identified through organization assessments. Launched in April 2017, Phase II of the ACE Initiative (2017-2022) is focused on ensuring highly effective, sustainable Oregon land trusts by building their capacity to generate broad and deep support for land conservation, support community priorities, and strategically conserve and stewards the region’s natural heritage, agricultural lands and high quality of life. In addition to the grant program, the Alliance will be piloting new tools, training and strategies to support this broad public engagement. 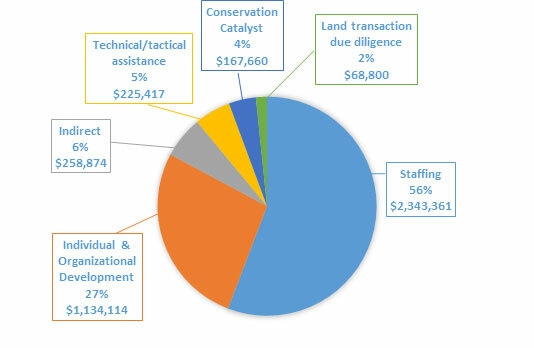 The majority of ACE funds have been directed to three-year staffing grants to support a wide range of positions including executive director, conservation and stewardship, communications and outreach, and administrative. During the first phase of the Initiative, land trust staff in Oregon has grown by 32% to over 200 full-time employees. ACE funding for individual and organizational development support strategic, conservation, communications and fundraising planning, as well as staff and board training. Two-thirds of organizations participating in the program have used grant funds to create, update or revise their strategic plans. Funding has also supported outreach, landowner relationships and climate change plans. Almost $100,000 in funding has supported staff and board training, coaching and mentoring. The initiative has already demonstrated substantial early positive effects on the Oregon land trust community and partners — in terms of land conserved, community impact and partnerships, and fundraising. Oregon land trusts are doing strong, technically proficient land conservation work. They are building their staff capacity as well as outreach tools and strategies, improving their policies, procedures and governance, and are more deliberate and strategic in their conservation work. In July 2015, the Alliance hired an outside consultant, Peter Szabo of Bloomingdale Management Advisors, to conduct an evaluation of the first three years of the ACE Initiative. Peter found that resources have been thoughtfully directed, investments are laying the groundwork for future impact, and participants are satisfied with the program. Increased their community events by 84%. In 2016, almost 18,000 people participated in land trust events across the state. Increased the number of individual donors by 51% and business supporters by 64%. Built and strengthened community partnerships — 94% of Oregon land trusts reported that ACE involvement has helped strengthen or build partnerships. The ACE Initiative provided funding to the accredited North Coast Land Conservancy for a marketing and communications plan to help identify their target audience and clarify the content, staffing and approach needed to reach that audience effectively. Administrative staff, a temporary communications staff, a development director and seasonal stewardship staff were all hired with ACE support. They gave their summer events series on their properties a complete makeover — turning hikes into natural history walks aimed at a broader audience — and promoted these events more widely across the community. The result was a 90% increase in event participants over the course of the grant period. Having better communications materials, and the staff to execute and follow up, has improved fundraising tremendously. North Coast’s individual donor base has doubled in size since the beginning of the program. Friends of the Columbia Gorge used ACE Initiative funding to develop a robust planned giving program. The land trust created communications materials about the planned giving program, updated their planned giving website, held a planned giving seminar and launched a kickoff event for the program. A planned giving video and wealth screening of donors catalyzed the program. To date, the land trust has received over $10 million in bequests. They have grown their confirmed planned gifts from 40 to over 100 in two years, with an additional 120 people expressing interest in the program. The ACE Initiative has helped grow the capacity and effectiveness of the accredited Wallowa Land Trust by investing in the executive director, conservation director and administrative positions. The land trust doubled their staff, doubled the amount of land conserved and achieved accreditation during the first phase of the Initiative. ACE funding also supports the Wallowa Lake Moraine Partnership in an effort to secure public access on the East Moraine while conserving the land for future generations. In 2016, Wallowa Land Trust and its partners, The Nature Conservancy and Wallowa Resources, secured $3.2 million through the Regional Conservation Partnership Program to offer tools and incentives to willing landowners that will conserve more than 16,000 acres of farm and ranch land in Wallowa County. The ACE Initiative has supported the accredited Southern Oregon Land Conservancy (SOLC) through marketing and outreach efforts, increased staffing capacity and fundraising consulting. Expanded outreach including direct mail, newsletters, tabling at events and professional videos generated excitement over the 352-acre Rogue River Preserve. SOLC successfully completed their $3.5 million Heart of the Rogue capital campaign to protect the preserve in December 2016. The project galvanized their community, gaining the organization 200 new members in just three months.